The Argentina FA has confirmed that the two-time World Champions will face Nigeria in a friendly in the Russian city of Krasnodar on 14 November. 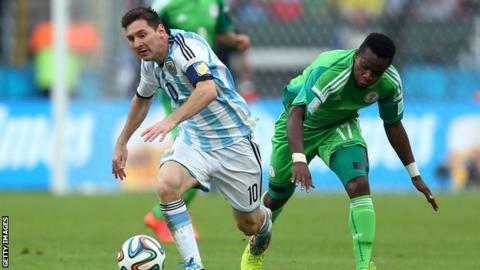 Three-time African champions Nigeria, who became the first African country to book a spot in Russia, are regarded as tough opposition as Argentina prepare for their 2018 World Cup campaign. Both countries will meet for the eighth time at senior international level and for the first time since 2014, when Argentina won 3-2 at the World Cup in Brazil. The Super Eagles famously defeated Argentina 4-1 in a friendly at home back in June 2011 but overall Argentina hold a 5-1 head-to-head record. The South Americans have beaten Nigeria four times at the World Cup, with the West Africans losing by the odd goal in each of the matches. Argentina edged Nigeria 2-1 in 1994, 1-0 in 2002 and 2010, as well as the thrilling 3-2 at the last World Cup tournament. They played out a goalless draw at the 1995 Fifa Confederations Cup in Saudi Arabia. Nigeria's next international match will be the dead rubber in Algeria in their final World Cup qualifying match on 10 November, while Argentina face Russia in a friendly in Moscow on 11 November.